Jon, It was a thrill and a privilege to have your show live-streaming in my cottage in (very) rural Brittany, France. As an American expat originally from NJ and longtime Jon Katz devotee/blog supporter it was a joy to listen. Looking forward with eagerness to next week’s broadcast! Thanks Julie, it was a thrill to get this message. And a privilege. My young radio broadcast “Talking To Animals,” on every Wednesday from one to three from WBTNAM1370, is using technology (and my precious blog) to reach out far beyond our rural borders. So far we’ve had calls from Canada, Italy, Paris, Trieste, Italy, California, Vermont, New York, Pennsylvania, Michigan, New Mexico, Massachusetts, Virginia, Maryland and Florida. New technology makes almost everyone – and every radio station – global. You can catch the show livestreamed here, hear it on the free Simple Radio app almost anywhere in the world, call me live on 866 406-9286, or e-mail me your questions: jon@bedlamfarm.com. The show is friendly, hopefully thoughtful and useful. Next show is next Wednesday, December 12, one to three p.m.
Red is still recovering from his paralysis and possible spinal fracture, the ramp we ordered for him to use to get into the car arrived today, he freaked when he saw it. We’ll get there. He’s eating and moving cautiously. Acupuncture next week. He’s getting lots of rest, love and attention. In two weeks, I will get to see Maria Belly Dance for the first time. She will dance at a Hafla, a showing for the Belly Dancers and their families at Christmas. It is not open to the public. Maria wrote a wonderful piece about what this group has meant to her, how she is working to overcome her panic at performing, and how the experience so closely echoes issues in her early life. It’s a compelling and powerful piece. Belly Dancing is changing her life. This is turning out, I think, to be an important milestone in Maria’s journey. I’ll let her tell it. I’m excited about it. Belly Dancing is not about technique or even performance. It’s about feeling. and attitude. Maria is rich with both. Speaking of compelling pieces, our friend Susan Popper, who has struggled with obesity and hidden herself from much of the world for much of her life, wrote a wonderful piece about her liberation, her brave efforts to meet the planet which she loves on. It’s on her blog Just Susan. I recommend it to anyone who has been crippled by fear, shame or anger. One week from today, I’ll begin a three-day retreat, to meditate, rest, gather my thoughts and finish the three remaining chapters on my forthcoming book about Bud and Gus. I got a message from a woman driving a tractor-trailer truck through the Northeast, she said she was planning to drop by the farm in a couple of hours and meet Simon, she said I seemed so friendly on the blog that she knew it would be okay to just stop by and park the truck and spend some time on the farm between jobs. I told her I was flattered, but that Simon was dead, the farm is not open to visitors apart from the Open Houses, Maria and I both work, and many people thought I was far from friendly. Have a good trip, though. I did not hear back. I felt badly for a few minutes, I wondered why I wasn’t the kind of person who could just open up and let the world in. What would it really cost me? But I’m afraid I just can’t. At some point in life, you just have to accept who you are. I also was troubled a bit by the assumptions in her letter. It’s one thing to ask if a visit would be welcome, another to say she was on her way with a tractor-trailer to spend some time with me on the farm hoping to see a donkey who was now dead. It wasn’t a good vibe. I decided it wasn’t flattering, but I was nice and polite. I do remember a morning in Hebron when a yellow school bus pulled into the driveway and disgorged 45 Middle-School children who were heading for a local zoo but found it was closed when they arrived. The teachers, somewhat desperate, thought of my farm and introduced themselves as dog lovers and said they knew I wouldn’t mind. The kids were charging towards the gate as I stood open-mouthed and somewhat paralyzed. The donkeys were looking anything but welcome as these screaming kids charged towards them. I had Carol the ill-tempered donkey then, and she didn’t like me, let alone strangers. And her ears were back. I got to the gate in time. I gave a ten minute speech, taught the kids to stick carrots through the fence and said goodbye. There was also the stalker who came into my house while I was up in the pasture and tried to take one of my dog Orson out with her for a ride or for good. Rose, bless her, sounded the alarm up on the hill and went charging down. The stalker fled. The police caught her – she didn’t get the dog, she would have regretted Orson – with a notebook full of hundreds of photographs of me going back a few years. She was wanted for something else, it turned out, she was sent off to an institution. She called me from time to time for several years from a correctional facility, but I haven’t heard from her since. And I’m not even famous. My life is kind of interesting, and I appreciate that. I have trained two Neapolitan Mastiffs to use a ramp, and they are not the most trainable breed. Just start slow. Lay the ramp flat on the ground and have Red walk on the ramp while it is flat. I used treats to lure my dogs, but don’t know if you need treats for Red, as he seems to be extremely obedient. After he is comfortable walking the ramp while it is flat, raise it up by one step, and once he is comfortable with that, keep raising it until you get him where you want him to be. I’m sure you will get there with Red. Training Red to use the ramp is something I would love to watch because none of my labs wanted to get onto ramps or pet stairs and I had to come up with an alternative, a raised dog bed made of light metal and mesh. Both dogs were pretty scared and for my 12 year-old who was paralysed in April for 2 days, he could have hurt his back even more if I kept on trying to get him onto the ramp. Good luck! I’ll be eagerly watching if you decide to film your training. I’m a long time reader of your books, and just found your blog recently. 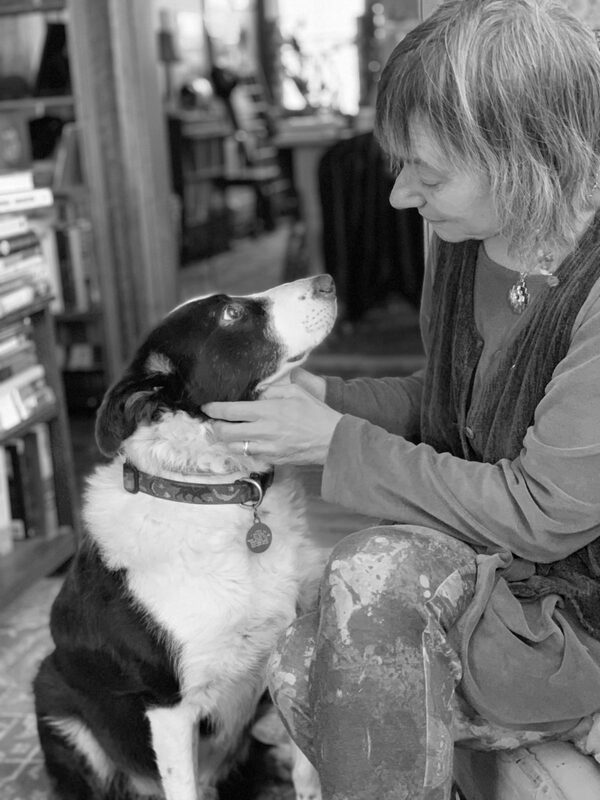 I think you write compellingly about your life on the farm, your beloved dogs and your inner reality. All with remarkable [ and rare] honesty. I can only imagine how fraught it must be dealing with your fans or followers, whatever you choose to call them. My reason for writing is that when that lady with her tractor trailer hoped to stop by and meet Simon, you were brutal or possibly blunt, in the way you said he was dead. I felt in a similar way after reading your ‘ Last Chance Dog’ and when I went to your blog, sadly didn’t find her there at all. I concluded she must have died, not really a surprize I guess, since you published that book over 8 years ago now. But it was a blow, since you drew us so deeply into your world with her. Thank you for creating that video of her, it helped alot to be able to see her. I guess I am really writing to say thank you for all that you share, it can’t be easy at times. Thanks Louise, for your thoughtful and interesting message. I do understand how people feel, really, but death is a part of life here, and I can’t dwell on that and don’t wish to. Pain is an inevitable part of life, suffering is a choice to me. I am grateful for your message.